The Los Angeles Fire Department’s (LAFD) Urban Search and Rescue (US&R) Program is a dynamic system, which has evolved over the past decade and includes a variety of response levels. The first real step in a structured response system began on April 4, 1993. The Mayor and City Council authorized the Fire Department to enter into a Memorandum of Agreement with the Governor’s Office of Emergency Services (OES) and the Federal Emergency Management Agency (FEMA) to become a sponsoring agency for one of the nation’s 28 FEMA US&R Task Forces. Concurrent to the development of a FEMA US&R Task Force in Los Angeles, efforts were made to enhance the Fire Department’s US&R component to provide a 24-hour response capability. This Task Force, designated CA-TF1, when activated would deploy a 70-member team staffed by Fire Department personnel, Structural Engineers from the Department of Building and Safety, canine search handlers from the Department and civilian ranks, and doctors from private industry. The US&R Unit coordinates the training and development of this multi-agency response system. There are eight FEMA US&R Task Forces in the State with a total of 28 Task Forces nationwide. Each Task Force is required to have a minimum of 210 total members, using the “two team concept” this allows for the deployment of a highly trained 70-member team. The teams include command staff, medical staff and four functional specialist groups. The four functional groups are Search, Rescue, Medical and Technical specialists. The operational concept for the activation of a FEMA Task Force is predicated on a request for a Presidential disaster declaration. The activation request is initiated by FEMA, through CalOES, to the sponsoring agency. For an out-of area event, Task Forces are required to be mobilized at an assigned point of departure within six hours of accepting an activation request. FEMA Task Forces are equipped to be totally self-sufficient for at least the first 72 hours and capable of 24-hour operation, for durations up to 10 days. This includes food, water, clothing, shelter, sanitation, communications, command, and of course, the tools and equipment necessary to perform technical search and rescue operations. When CA-TF1 is mobilized to a disaster out of the area, there are two mobilization plans. The equipment can be loaded onto military pallets and secured for air transport or, if so ordered, the equipment and personnel can travel by ground. CA-TF1 has two-40’ tractor/trailers, two-24’ crew cab box vans, three-crew cab pick up trucks, and rental agreements with charter bus agencies to handle a deployment by ground. These resources of staffing and equipment can also provide search and rescue capabilities to any localized event. The LAFD 24-hour US&R resources are geographically located by Bureau for optimum coverage. Presently, there are six US&R Task Forces, two in Valley Bureau, two in West Bureau, one in Central Bureau, and one in South Bureau. Each of the US&R Task Forces 3,5, 27, 85, 88, and 89 have been trained in technical search and rescue operations and each TF has a specialized, technical rescue vehicle custom made for the LAFD by the Pierce Corporation. These self-sufficient vehicles have the ability to power their own equipment and lighting; provide air and hydraulic supply for the variety of lifting, cutting and breaking tools and equipment; and carry items such as fiber optic search devices for state-of-the-art searching. On, Monday, January 17,1994, at 4:31 a.m., the most destructive earthquake in the history of Los Angeles struck as most of the City slept. Fifty-seven fatalities were attributed to this earthquake, with more than 25 percent of this total (16 people) killed as the result of a single structure collapse, the Northridge Meadows apartment building. Initially, a five-member Search and Rescue Group formed with a mixture of off-duty Disaster Preparedness members and US&R instructors who loaded equipment onto a stake-bed truck and an 18’ trailer. At 6:30 a.m. on that morning, “US&R One” coordinated and assisted search and recovery efforts at the Northridge Meadows apartment, the Northridge Mall parking structure collapse, and wherever else they were needed. Eventually, US&R 2, 3 and 4 would be formed and continue to operate until January 28, 1994. As a result of the search and rescue activities experienced during the Northridge earthquake, US&R demonstrated that highly specialized, trained, well equipped, and self-sufficient urban search and rescue resources could be mobilized and quickly deployed to provide lifesaving expertise and equipment. The World Trade Center terrorist attack was CA-TF1’s first real trial by-fire. Although the City was taking actions to prepare for additional attacks, it soon became clear that the World Trade Center and the Pentagon incidents would require massive search and rescue efforts. Prior to the official notification of activation from FEMA, the US&R Unit began a call-out of the qualified personnel to staff CA-TF1. A verbal activation order was received at 1200 hours followed by the official order at 1412 hours. A total of 70 members were “rostered” and were soon aboard three military C-141 aircraft. For the next 9 days, CA-TF1 conducted search, rescue and recovery missions in, under, and around the South Tower. “Live alerts” by CA-TF1’s search canines occurred during the first four days of operation. CA-TF1 participated in the recovery of 30 – 35 bodies. Unfortunately, no live rescues were made. On September 21, 2001, CA-TF1 returned home and was met by a cheering crowd of family and friends. The men and women of CA-TF1 used a combination of knowledge, experience, advanced equipment and, most of all, courage in the time of national crisis to help the people of New York. From February 3-10, 2002, CA-TF1 was deployed to Salt Lake City, Utah, to provide standby during the 2002 Winter Olympics. This was the first deployment of CA-TF1 as a Weapons of Mass Destruction (WMD) US&R Task Force. The mission was to remain prepared for deployment for any WMD or US&R incident that might have occurred during the Olympics. Although CA-TF1 did not respond to any incidents, each day was filled with preparedness duties and training exercises. A Rapid Response Team concept was developed and refined. The below-freezing temperatures gave the firefighters a deeper appreciation of our Southern California climate. When the hills above La Conchita suddenly buried people and homes during January 2005’s heavy rainstorms, LAFD US&R resources responded to the incident. Members of the Ventura County Fire Department were on scene to witness the event and immediately called for US&R resources. US&R 88 and US&R Task Force 85 were on scene within one hour. US&R 88 used its powerful rooftop lighting system to light up the mountainside. This allowed rescuers to work safely and continue rescue efforts while safety officers kept a watchful vigil for further land movement. For the next four days, search canines, tractors, and manual labor kept hopes alive for the families of the missing victims. On January 26, 2005 two Metro Link commuter trains derailed along the Glendale and City of Los Angeles borders. US&R 88 and US&R Task Forces 27 and 88 were dispatched to the incident. During this deadly incident, US&R members assisted with search, rescue, cutting, and stabilizing leaning passenger cars. This valuable combined resource of staffing and equipment assisted both Departments in speeding up rescue and recovery efforts. On August 31, 2005 CA-TF1 was requested by FEMA to respond to Dallas, Texas to Stage for Hurricane Katrina. This deployment was a ground-based deployment. On August 6, 2005 CA-TF1 was dispatched to Gulfport, Mississippi to conduct search and rescue operations in the Gulfport / Biloxi area of Mississippi. CA-TF1 conducted wide area searches of the area as well as a de-layering operation to confirm that no victims were in the debris of a collapsed apartment building in Biloxi. CA-TF1 also provided humanitarian support for community members of the Gulfport / Biloxi region. Hurricane Katrina was the eleventh named storm and fifth hurricane of the 2005 Atlantic hurricane season. It was the costliest natural disaster, as well as one of the five deadliest hurricanes, in the history of the United States. On September 10, 2005 CA-TF1 was demobilized and returned home. On August 28, 2008 CA-TF1 was deployed as a Type 3 team to both Hurricane Gustav and Hurricane Ike. During the Hurricane Gustav part of the deployment CA-TF1 traveled from Los Angeles, California to Houston, Texas. During this deployment members of CA-TF1 prepared for the arrival of Hurricane Gustav by conducting position specific training for the members of CA-TF1. CA-TF1 was assigned to the Beaumont, Texas area for the arrival of Hurricane Gustav. Hurricane Gustav had no significant impact on the Beaumont, Texas area and CA-TF1 was re-assigned to Houston staging by the FEMA US&R Blue Incident Support Team. On September 5, 2008, CA-TF1 was re-assigned to Hurricane Ike. CA-TF1 remained at staging in Houston, Texas. During this time in Houston, Texas CA-TF1 members conducted training and preparedness for all CA-Tf1 members in hurricane preparedness. This was the first time that CA-TF1 members would be staging in the impact zone of the hurricane. Hurricane Ike made landfall in Galveston, Texas on September 12, 2008. On September 13, 2008, CA-TF1 conducted search and rescue operations in Beaumont, Texas. CA-TF1 worked in the Beaumont area until September 16, 2008. During this time CA-TF1 performed 130 rescues and one CA-TF1 member became ill during this time period and was flown home. On September 16, 2008, CA-TF1 was re-assigned to Galveston, Texas. CA-TF1 was assigned to search the area near Schole’s Airport. The area consisted of a mix of commercial and residential dwellings. CA-TF1 conducted search and rescue missions in the area until 1400 hours. During the search operations in Galveston one CA-TF1 member made a request to be sent home for personal reasons and was transported to Bush International Airport for departure home. All CA-TF1 members returned to Houston, Texas for staging. On September 17, 2008, was demobilized at 0800. CA-TF1 recovery team was sent to Houston, Texas to retrieve the cache and drive home while the original deployed team flew home. The mission of saving lives and property has always been the mission of the fire service. Although US&R has now been a part of the LAFD for 22 years it is still a relatively new and modern approach to the saving lives mission when compared to traditional firefighting. What used to be done with manila rope and a myriad of knots has been replaced by multi-ply rope, webbing, and hardware to eliminate those knots. New technology has improved our gas detection monitors to eliminate the guesswork of working in hazardous atmospheres. In addition, extrications in collapsed structures and remote areas can be made with cordless power tools. The six LAFD US&R Task Forces are well on their way to meeting the demands of this changing mission. Currently a new state-of-the-art US&R rig, designed by Department members, is now in the design and construction process. The US&R apparatus are equipped with pneumatic, hydraulic, and generating systems to supply power to the many specialized tools. New equipment has been added to the existing inventories for more efficient and faster searches, rescues, and overall member/victim safety. Tactical concepts have been developed to enhance US&R operational capabilities. Partnering with LAFD Air Operations an airborne US&R Company can be quickly delivered anywhere in the region to assist neighboring cities in times of need. When a structure fire breaks out, US&R Task Forces will become dedicated rapid intervention companies. These companies will monitor the dangerous deteriorating condition of a structure, keep a watchful eye on the interior fire attack companies, and launch an all-out rescue of a downed firefighter if the unfortunate need should arise. 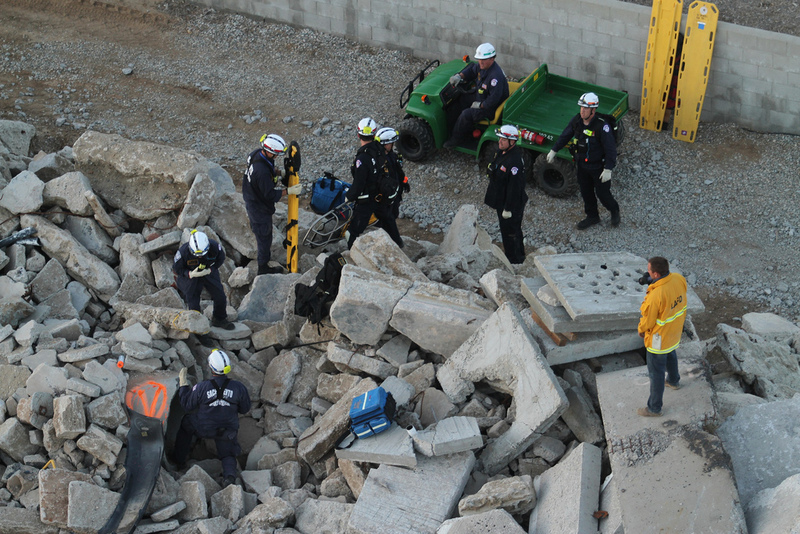 LAFD’s Urban Search and Rescue component is taking the art of protecting life and property to new levels. Where homeland security is a daily part of our lives and an earthquake can shake us out of our senses, the demands of keeping up with new skills and technologies are being met. LAFD firefighters responding to emergencies have always brought along with them their superior knowledge, skills, and abilities that are a hallmark of the Department. Now, and in the not-so-distant future, they will be able to take with them state-of-the-art equipment and technologies to provide faster, safer, and smarter protection for the firefighters and citizens of Southern California.